The trailer is undergoing minor restoration, though there is not power plant for trailer the body needs some minimal attention. 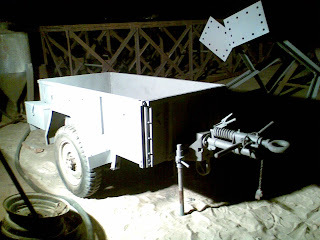 As the trailer was parked in the open yards in military space, I thought will do some sand blasting and minimal painting job. 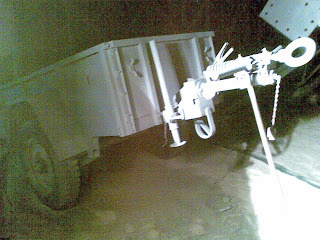 But after sand blasting I found the trailer also needs some tinker job, hence sand blasted and primer applied but no painting. As the recession hit the world and the symptoms are started showing up with me, I have decided to do the painting and bit of word at later stage. 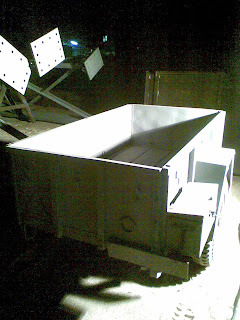 Here is the picture showing my Trailer after sand blasting and primer painting. Njoy!